Room features a combination of jamb brackets (R1/R2) and coupler brackets (R5) to create a shade wall. Coupler brackets (R5) join shade rolls for a continuous look. Jamb brackets (R1/R2) are can be mounted inside a window casing or to a wall. J Geiger’s flagship R Series Shading System was designed to be seen. Unsightly wires and screws are concealed within the system, eliminating the need for valances, fascia, and ceiling pockets. Brackets can be combined in numerous ways to accommodate unique architectural elements. The diameter of the shade roll is an identical match to each bracket profile, ensuring a seamless transition from shade to bracket. 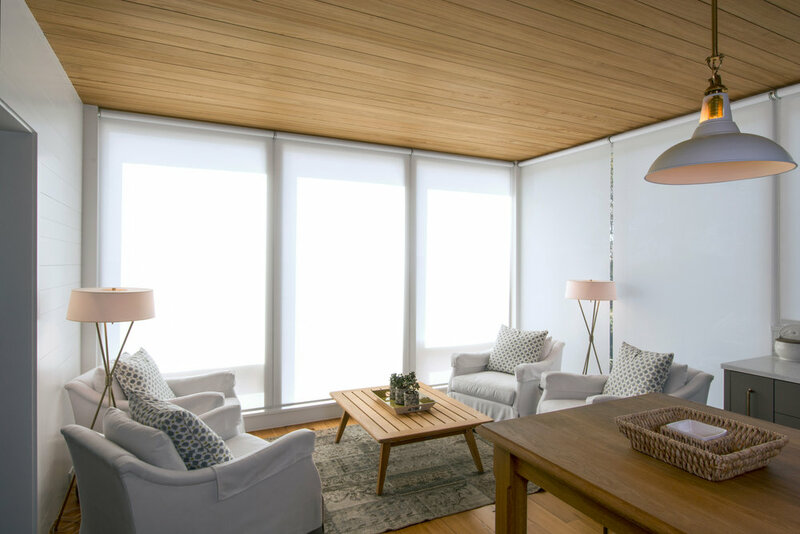 When shades are mounted in series, the matching profiles form a clean, continuous line. Jamb Brackets (R1 and R2) can be mounted inside the window casing for a low-profile look. Each bracket is just under 2.5”in diameter. Floating Brackets (R3 and R4) can be mounted outside of the window casing (to wall or ceiling). Coupler Brackets (R5) can be mounted between shade rolls to create a shade wall. 90° Brackets can be mounted into corners. Wired motors are smart home compatible and can be seamlessly integrated with Savant, Crestron, Lutron and Control 4 systems. For homes and businesses without control systems, wired motors can be linked to a keypad, remote, or app for smartphone or tablet control. Battery powered motors are rechargeable and can last over a year on a single charge. Battery life depends on shade size and frequency of use. Batteries remain in the shade tube while charging, eliminating the need to change batteries. Battery motors can be remote, keypad, or voice* controlled. *Hub required for voice control.